Petite shoulder-ready go-to saffiano leather. One inside zip pocket. 9.5"W X 7"H X 3"D. Fully lined. Quilted with pebbled leather. Interior has one zip pocket. Chain detail shoulder strap with 23" drop. KARL LAGERFELD Paris Blue Leather Crossbody HANDBAG . 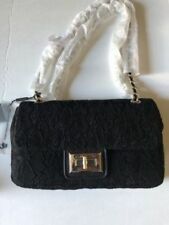 Beautiful purse Selling as pre owned, but looks like new Please see pictures for details What you see is what you will get Buy it now or make us an offer. Length 8” Height 5” Width 2” Height from bottom to strap 28” Zipper opening 8” From clean and smoke free home Thanks for looking! 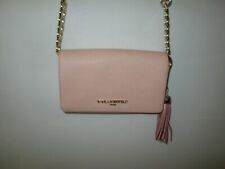 Karl Lagerfield small crossbody purse. Done in a peachy pink Saffiano leather with gold-tone hardware. The interior is lined with beige fabric and includes a zip wall pocket on one side and a slip wall pocket on the opposite side. KARL LAGERFELD PARIS BLACK QUILTED SHOULDER BOX LEATHER BAG WITH GOLD CHAIN STRAP. 100% Authentic Signature Iconic Tissue Paper stuffed inside to keep form. Shoulder bag with leather and chain strap. Flap Closure with turn lock marked. Original price $148 !!! 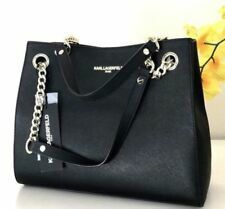 KARL LAGERFELD Amelie Saffiano Leather! Brand NEW CROSSBODY Bag PURSE logo. Condition is New with tags. Shipped with USPS Priority Mail. • SPINLOCK FLAP CLOSURE. • ONE OUTSIDE SLIP POCKET. • ONE INSIDE ZIPPER POCKET. Karl Lagerfeld. Karl Lagerfeld Paris Tote Handbag. Faux Leather. Any item sold by the Seattle Goodwill is eligible for local pick up at our warehouse. Because Jobs Change Lives! No exceptions can be made. KARL LAGERFELD PARIS PEBBLE CHAIN SATCHEL LEATHER. Chain detail shoulder strap with 9" drop. Zip top closure. Interior has 1 zip pocket with logo label plus 2 open. S ale is final. But it’s kind of lost it’s shape. Karl Lagerfeld Paris R-Canlle Bow Tote in Peony Pink LH6BZ264 MSRP $148. It's new with tags. Its iconic and stylish. Perfect to put everything you need to enjoy the warm weather during outings! It has three compartments inside and one of them has a zipper. Only one available. This item has been stored in a clean, safe, smoke-free, and pet-free environment. Foldover magnetic closure Goldtone hardware One outside front slip pocket One outside zip pocket One outside back slip pocket with snap closure Two outside front zip pockets One inside zip pocket Two inside open pockets Lined. NWOT. Has very light, barely visible scratches on the pearl dot to storage and handling. Embellished Leather Crossbody Bag;On-trend leather crossbody bag with crystal and faux pearl embellishment. Magnetic-snap closure under flap. Two inside compartments. Lined. Leather. Wipe clean. Chain crossbody strap, 23" drop.7"W x 5"H x 2.5"D.
Karl Lagerfeld Paris Charlotte Pebble Crossbody Bag Purse Quilted Leather Bronze in great Condition a little color transfer on the back of the bag and it is Pre-owned. Shipped with USPS Priority Mail. In black soft leather. Very nicely lined. Hardware in gold. Perfect for any occasions. Karl Lagerfeld Paris Cara Black Floral Crossbody Nylon Messenger Bag NWT Essential textile messenger bag enhanced with logo detail. Foldover magnetic closure Goldtone hardware One outside front slip pocket One outside zip pocket One outside back slip pocket with snap closure Two outside front zip pockets One inside zip pocket Two inside open pockets Lined. 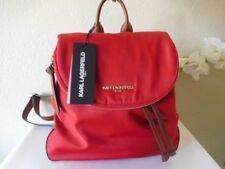 SIZE Adjustable strap, 14"-25" drop 12"W x 10"H x 4"D.
KARL LAGERFELD HANDBAG. Condition is Pre-owned. Shipped with USPS Priority Mail. KARL LAGERFELD AGYNESS QUILTED LEATHER LAMB FLAP SHOULDER BAG CROSSBODY PURSE. • SPINLOCK FLAP CLOSURE. • ONE OUTSIDE SLIP POCKET. • ONE INSIDE ZIPPER POCKET. • ONE INSIDE ZIP POCKET. Color: Peach. No exceptions can be made. Gorgeous Karl Lagerfeld Satchel. Genuine leather. Zipper main closure. One front exterior zipped pocket. Four protective feet on the bottom of bag. Perfect sized bag! Security snap in gold with logo. FINAL COLLECTION. 10.3"H x 14.5"W x 4.5"D. Interior, printed jacquard lining. One zip and two slip pockets. See pics, cracked at corners, can be fixed at a repair shop I just didn't want to invest more $ in the bag. This authentic Karl Lagerfeld bag is very roomy, with 3 inside pockets. It features Karl Lagerfeld signature lining. The strap is adjustable and detachable if desired. 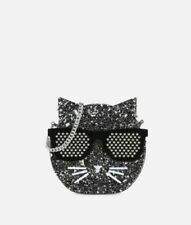 Karl Lagerfeld Maybelle Cat Cross Body Bag OR shoulder bag • 4.5" H X 2" D 7.5" W. • 1 CENTER DIVIDE. Karl Lagerfeld - OPHELIA. Detachable shoulder strap, strap to convert to a hand bag. Internal zipper pocket, 2 slit pockets. Snap-fastening front. Strap Length. Karl lagerfeld Pink Tote bag With Choupette Charm NEW. Gorgeous purse by Karl Lagerfeld. Superb quality, made for endurance. Karl Lagerfeld Satchel/Crossbody Bag. Interior: Lined with signature fabric. It has a side zipped pocket and two side slip pockets. 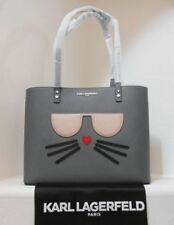 Karl Lagerfeld Paris Maybelle Saffiano Cat Face Crosbody Bag . Condition is New with tags. SAFFIANO Leather TOTE in BLACK With Gold Tone Colored Accents. Saffiano leather. 100% AUTHENTIC KARL LAGERFELD PARIS. Love the extra pocket in the front. Gold tone hardware. Front snap pocket. Inside zipper pocket. Features an airplane in flight with glitter stripes as trails in the sky. 100% AUTHENTIC KARL LAGERFELD (R.I.P.). CROSSBODY IN THE SIGNATURE KL PATTERN. COLOR IS BROWN AND KHAKI. STRAP IS PARTIAL CHAIN AND PARTIAL FAUX LEATHER. SNAP TO CLOSE. GOLD TONE HARDWARE. 250.00 NEW. Bag is in excellent condition. Style: Agyness. Gorgeous purse by Karl Lagerfeld. Superb quality, made for endurance. Karl Lagerfeld Shoulder Bag/Crossbody Bag. Interior: Lined with fabric. There is a side zipped pocket and two slip pockets. KARL LAGERFELD PARIS Black TOTE R. CANELLE HANDBAG EUC. Condition is Pre-owned. Shipped with USPS Priority Mail. Beautiful black handbag in pristine condition. I have too many purses and need to downsize. Hoping someone can get some use out of this adorable handbag :) Retails $120 . Purse is less than four months old. Very minimal signs of wear. Saffiano leather exterior. Detachable zippered pouch. Polished gold tone hardware. I am not a professional photographer but I try my best, however, the color may not be the tone or hue of the item.